I have analyzed the ruling and, as I'll explain further below, it's not all bad for Apple with a view to the final decision on those intellectual property rights that will come down at the end of the main proceeding (the process concerning the preliminary injunction request was only a temporary, parallel, fast track for a small subset of Apple's claims). It's possible that Apple will get a more favorable outcome on some of the asserted rights in the main proceeding. It's been clear all along that Apple undertook an ambitious project. Getting an injunction in the United States is never easy, and winning a preliminary injunction is even harder. But the ruling casts general doubt on Apple's strategy. What made Apple's motion fail is not merely the irreparable harm or balance of hardships part. That said, I think the ruling is partly based on erroneous positions on market dynamics (as I'll explain further below). Those mistakes were outcome-determinative against Apple with respect to some of its claims. It's unfortunate for Apple that the judge took positions that, in my experience with competition issues, economists would be rather unlikely to take (provided that they understand the relevant market and are impartial). Even without those mistakes, Apple wouldn't have won a ruling that would have been devastating to Samsung. Samsung could have easily worked around it, I believe. But the outcome would look much better for Apple if some of its claims had succeeded -- and a couple of them apparently would have succeeded if the competitive dynamics had been assessed more accurately. From a strategic point of view, it becomes clear that design patents are not the answer to Apple's issues with Samsung because their valid scope -- stripped of elements dictated by functional requirements and of elements found in prior art -- appears far too narrow to prevent Samsung from selling products with an attractive design that will still be fairly similar to that of Apple's offerings. Samsung doesn't have be "Samesung". As long as it's allowed to build products that consumers view as equally attractive as Apple's, and that are distinct enough to comply with the law but still similar enough in the eyes of actual and prospective buyers, Samsung will be just fine. As IP lawyer Matt Macari explained very well on The Verge, those asserting such rights are effectively forced to argue against the breadth of their own intellectual property in order to defend it against invalidation attempts based on claims of similar designs having existed before. If Apple wants to defend market share against Samsung (and other Android device makers), it really needs to focus on solid technical patents instead. I know many Apple fans won't be happy to hear that. After all, most of Steve Jobs's 300+ patents are design patents. The US Patent and Trademark Office honored Jobs with an exhibition related to his patented inventions and creations. The harsh reality is that those design patents aren't useful for much more than such a purpose. "Go hang your glory on the wall" (a line from an Elton John song at the end of Rocky V). The problem with the preliminary injunction motion is that Apple, in order to maximize the chances of the court taking a fast-track decision, had to focus on a few legal claims. In its main complaint (which is scheduled to go to trial on July 30, 2012), Apple actually told an impressive, coherent story, but it also involved other legal theories than just design patents. It remains to be seen whether the more holistic approach is going to yield a better result, but unfortunately the additional design-related claims brought by Apple in the main case (such as trade dresses) are even softer from a legal point of view than those design patents. A German court granted a preliminary injunction against the Galaxy Tab 10.1, but Samsung has relaunched the product with a slightly modified design (under the Galaxy Tab 10.1N name). Apple has asked the court to ban that product as well, and a hearing will take place on December 22. Even if Apple won a second preliminary injunction in Germany, it would likely take Samsung only one more iteration to come up with a non-infringing design. A court in The Hague, Netherlands granted Apple a preliminary injunction based on a photo gallery scrolling patent (a software patent) but threw out Apple's design-based claim against the Galaxy Tab 10.1. And as I explained above and will discuss in more detail further below, the court order denying Apple's motion for a preliminary injunction indicates to me that the outcome of the main proceeding in the U.S. will probably be somewhere in between the Dutch and German results, and therefore not be of much (if any) strategic use to Apple. Two months ago the court accepted amicus curiae briefs submitted by carriers Verizon and T-Mobile, arguing that a preliminary injunction against Samsung would be against the public interest because of the impact on 4G devices. But accepting such letters as a permissible intervention is one thing, and subscribing to their content is another. "The Court granted third parties, Verizon Wireless and T-Mobile, administrative motions seeking leave to file amicus curiae briefs. These third parties have voiced concerns regarding the effects of a preliminary injunction on their ability to sell products to customers. While the Court is cognizant of the consequences to third parties of granting preliminary injunctions, no additional weight was placed upon the arguments contained in the briefs of amicus curiae. The amicus briefs focus either on private interests (the interests in being able to sell products) or are duplicative of arguments made by Samsung. 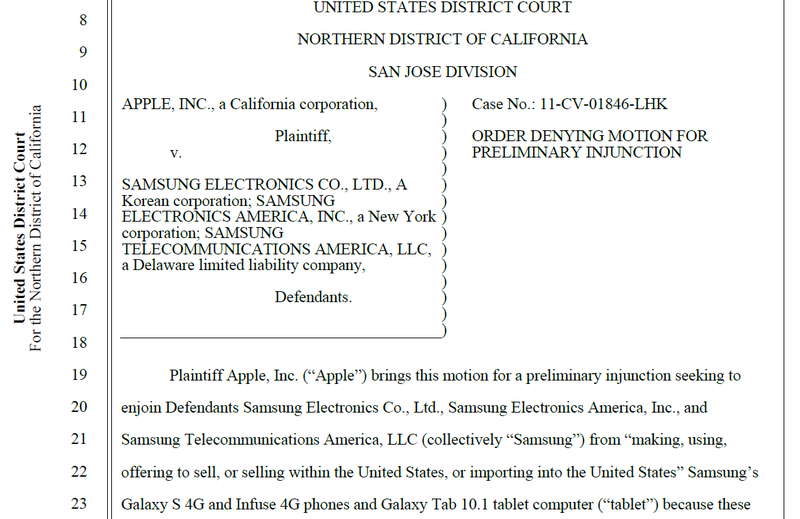 If Samsung is infringing upon Apple's patents, it is no more acceptable for third parties to benefit from Samsung’s unlawful actions than it is for Samsung itself to benefit." I had said all along that those briefs didn't make any strong argument, and they were probably just meant to lend some "political" support to Samsung. On this coming Tuesday (December 6, 2011), the ITC is expected to hand its final decision on Apple's first complaint against Android device maker HTC. Similar public interest arguments were also raised in that process (by Google and T-Mobile, and possibly others), and the ITC staff initially dismissed them but then modified its stance and advocated a six-month "exception". Industry body ACT (Association for Competitive Technology), however, disagreed with Google and T-Mobile, and even though the ITC can disagree with Judge Koh's conclusions (at this stage the ITC has likely already made up its mind anyway), the passage quoted above from the California ruling clearly validates the position taken by ACT. In each context, Apple had to "establish the following: (1) some likelihood of success on the merits of the underlying litigation; (2) immediate irreparable harm will result if the relief is not granted; (3) the balance of the hardships to the parties weighs in its favor; and (4) the public interest is best served by granting the injunctive relief." We can forget about the public interest, as I explained in the previous section. But each of the three other factors presented Samsung with an opportunity to defeat a given claim brought by Apple, or alternatively, Samsung had the chance to raise sufficient issues in two or all three areas to lead the court to conclude that an injunction wasn't justified. Also, in order to create sufficient doubt about Apple's likelihood of success on the merits, Samsung had two opportunities: it could prove the asserted right invalid or not infringed. It tried both, but succeeding on one of those two counts is sufficient in that part of the analysis. Apple asserted two iPhone-related design patents. One of them is derived from the other, and more narrow in scope. With respect to the broader one of the two, the court found that "Samsung has raised substantial questions regarding [its] validity", especially in light of a Japanese design-related right registered by Sharp. The narrower one of the two design patents is further narrowed by the fact that Samsung presented some prior art and convinced the court of some design elements being dictated by functional requirements. As a result, the further-narrowed narrower one of the two design patents has a scope that was just about broad enough that the judge felt that the Samsung Galaxy S and the Infuse 4G infringe on it. While the final decision could still be somewhat more favorable to Apple, this preliminary finding indicates clearly that Samsung can easily modify the design of those phones in order to design around the scope of any future ruling. One factor that also limits the value of those particular design patents is that Apple only claimed the front side of the device. The patent documents also show some rough outlines of the other sides, but the judge didn't attach any legal relevance to those depictions. For the purposes of the preliminary injunction, what tipped the scales in Samsung's favor is that the judge doesn't believe Apple's claimed "design 'distinctiveness' establishes irreparable harm". On this part I think Apple might have had a bit more luck with a different judge. Judge Koh clearly took a very conservative approach here (as most judges in the US do) to the question of whether an infringement also causes irreparable harm. She really wanted to ensure that the bar remained high enough that there was still room for infringements that don't entitle the right holder to injunctive relief. In my view, she's been too skeptical of Apple's claims in this regard. Design clearly is one of Apple's major success factors as I'm sure most people would agree. While I don't necessarily disagree with her conclusion, I think her ruling is excessively skeptical of Apple's related claims, and I wouldn't be surprised if Apple got a better outcome in this respect at the end of the main proceeding, based on evidence that would persuade Judge Koh later. Also, I think that Apple's and Samsung's market shares are so high that Judge Koh shouldn't have dismissed quite so easily Apple's claim that Samsung's sales bite into its market share. Right now the smartphone market is growing fast, so the simple kind of evidence that declining sales might constitute (though declining sales could also have various reasons) isn't available, but I believe that even a fast-growing major player shouldn't have to tolerate infringement if he could otherwise grow even much faster. This part of Judge Koh's reasoning appears highly problematic precedent to me, as much as I really like other parts of her decision (above all, her balanced, well-reasoned approach toward the valid scope of Apple's asserted rights). I also doubt that she uses a proper market definition. The smartphone market in the US is still growing quite fast, at the expense of feature phones. But as I'll explain in the next section, a statement in connection with the tablet market sugests that Judge Koh looked at mobile phone sales as a whole because she highlights, as a characteristic setting the iPad target market apart from the iPhojne target market, that the tablet market is growing. At any rate, the outcome is that equitable considerations made Judge Koh refrain, at this stage, from an injunction related to two iPhone design patents. "The Court finds that the 1994 Fidler/Knight Ridder tablet creates 'basically the same visual impression' as the D'889 patent. [...] The 1994 Fidler/Knight Ridder tablet is also a simple rectangular tablet with four evenly rounded corners. The front screen is a flat reflective surface surrounded by a rim on all four sides. The back-side, though it apparently has four screws, is essentially flat. The area surrounding the screen is admittedly not entirely symmetrical on all four sides, but none of these minor differences distracts from the overall visual appearance of the 1994 Fidler/Knight Ridder tablet as a simple and portable rectangular tablet with the same overall visual impression as the D'889 patent." But what decided this it wasn't just the Knight Ridder piece alone. To the extent that Apple argued its design patent presents elements not found in the Knight Ridder example, Samsung presented examples of "several other prior art references that disclose various aspects of the D'889 patent". This is the way the Düsseldorf Regional Court should also have looked at it rather than dismissing each of Samsung's prior art contentions on its own. In connection with the iPhone design, Judge Koh agreed with Apple, at least for the time being (until Samsung comes up with better evidence), that the narrower one of the two design patents added a characteristic that wasn't "obvious" because it was previously seen only in connection with tablets, not phones. But as far as the tablet design is concerned, there are all sorts of comparable devices that collectively cast doubt on the validity of Apple's iPad design patent. If Apple can still convince the court that its tablet design patent is valid, Samsung will likely be found to have infringed it. Judge Koh noted that "the Galaxy Tab 10.1 is virtually indistinguishable from these Apple products" and that "Samsung appears to have created a design that is likely to deceive an ordinary observer". That's an infringement slam dunk, but it only matters if the asserted right is valid. Since the judge currently thinks it's invalid, it would only survive in a very narrow form if it survived at all. The questionable validity of the asserted design patent was all that prevented Apple from winning an injunction against the Galaxy Tab 10.1. Judge Koh would be more inclined to find that Apple suffers irreparable harm in the iPad than the iPhone target market. She notes that "there appear to be fewer players in the tablet market, and the market is growing". While I don't disagree with her conclusion that Galaxy Tab sales bite into iPad sales, the two reasons I just quoted are the wrong ones. Her strength may be intellectual property and other parts of the law, but there are reasons why antitrust regulators, who have to deal with such competition issues all the time, usually have both lawyers and economists on their team. With an economic adviser, Judge Koh might have taken somewhat different positions on some of the market-related issues. For example, it's a fact that there can be very intense competition in a market even with few participants, and saying that the market for the iPad is growing (conversely claiming the market for the iPhone is not growing) points again to the wrong market definition I mentioned before. Even if Apple successfully enforced this design patent, I don't think it would be hard for Samsung to redesign its product so as to steer clear of infringement. For example, the modified design with which Samsung relaunched the Galaxy Tab 10.1 in Germany might also be legally acceptable in the US, or at least not far from a non-infringing design. If Apple can prove the iPad design patent valid at all, its valid scope will be rather narrow in the US. It should also be viewed as narrow in Germany. Unfortunately the judge in Düsseldorf took a different position, but we'll see if the appellate court overturns that extreme position at least in part. Samsung did not persuade Judge Koh that the '381 list-scrolling patent, which I once called "Apple's favorite make-Android-awkward patent", is anything but perfectly valid. 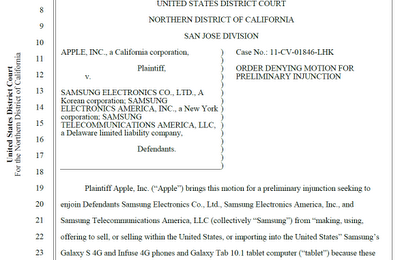 Also, there's a clear infringement case with a view to past products shipped by Samsung. Samsung's new products have a workaround, which results in a certain degradation of the user experience, but Apple would have to enforce half a dozen patents of this kind in order to reach the point at which consumers would experience Android-based devices as having a user experience so inferior that it could affect their purchasing decisions. Even though Apple had a clear case of an infringement of a valid software patent, Judge Koh held that "Apple has failed to meet its burden to establish that money damages will not be sufficient to compensate Apple for the Samsung products that likely infringe the '381 patent". For example, Apple has not "shown that consumers' purchasing decisions are based on the existence of a snap back feature protected by the '381 patent". Again, my view is that this is a highly important patent, but it takes multiple patents of this kind to really have competitive impact. While the court withdrew the original version of the decision from the public record and then replaced it with a redacted one (which was subsequently replaced with a differently-redacted one), it's easy to conclude from the non-redacted parts that this is a patent Apple was potentially willing to license out to Samsung as part of an overall settlement. I would have thought that this patent was among those Apple would not let any Android device maker use. Apple raised an objection that its offer to license this patent was only part of a compromise proposal and shouldn't even have been admitted as evidence in this particular context. Anyway, whatever Apple might have offered to Samsung in 2010 is not necessarily what a settlement in 2012 or later will look like. And these two companies will probably still be suing each other for quite some more time (and around the globe) before they reach an agreement.